Towards Relational Sociology argues that social worlds comprise networks of interaction and relations. Crossley asserts that relations are lived trajectories of iterated interaction, built up through a history of interaction, but also entailing anticipation of future interaction. In addition, he demonstrates how networks comprise multiple dyadic relations which are mutually transformed through their combination. On this conceptual basis he builds a relational foundation for sociology. Over the course of the book, three central sociological dichotomies are addressed - individualism/holism, structure/agency and micro/macro – and utilised as a foil against which to construct the case for relational sociology. 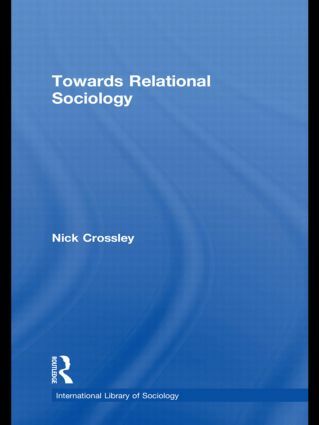 Through this, Crossley is able to argue that neither individuals nor ‘wholes’ - in the traditional sociological sense - should take precedence in sociology. Rather sociologists should focus upon evolving and dynamic networks of interaction and relations. The book covers many of the key concepts and concerns of contemporary sociology, including identity, power, exchange and meaning. As such it is an invaluable reference tool for postgraduate students and researchers alike.